The death toll from wildfires raging in northern California rose to at least 35 early Saturday as firefighters continued to battle blazes around the state that have burned more than 221,000 acres and destroyed thousands of homes and other structures. "He's the bravest, sweetest kid I know," Kai's aunt, Mindi Ramos, said. She said his sister Kressa, and mother, Sara, were also severely burned and are hospitalized. Sara Shepherd is in a burn ward but is lucid and is able to nod yes and no, she said. "I'm grateful she's still here. And I'm really proud of how hard she's fighting. She's fighting so hard,” Ramos said. Sonoma County Sheriff Rob Giordano said Friday that 19 people have died in fires, and 235 people are still considered missing in the wake of fires burning in the county. "We have 45 search and rescue people out in the field, 30 detectives right now and they’re starting targeted searches for those locations to try and find those people and recover remains," Giordano said Friday afternoon. Of 1,485 total reports of missing persons since the fires began, 1,250 have been found safe, he said later in the day. The fires in Sonoma County have forced thousands of evacuations. Twenty miles south of Sonoma, the "50 acres lot,” as it’s called, has become an unofficial refuge for those displaced by the fires. It's a grassy field owned by the Sonoma Raceway across the highway, but this week, it’s become home to hundreds. Around 100 trailers and RVs were parked there Friday, and some were sleeping in tents. Sisters Katie and Emily Bachelder picked up snacks from the table of donated food; they’ve been camping here since Wednesday with their mom, Michelle. "The hardest part is sitting and waiting and not knowing what will happen,” said Katie, 26, who has lived in Sonoma all her life. “I’m just glad everyone is there for each other. "All of a sudden, it just started coming down the hill towards us." The Raceway has provided hot meals and shower and restroom facilities. “We have all this land and so this is a service we can provide,” said Michael Max, who works for Sonoma Raceway and has been helping register anyone who turns down the gravel road to the impromptu campground. Chefs from nearby restaurants are regularly delivering food and handing it out to those at the campsite – including breakfast burritos this morning. Under the orange glow of a sun beaming through the haze of smoke, Bob and Juliana Hoewing washed dishes from their morning meal. They escaped the fire at 3 a.m. Monday when a neighbor banged on the door of their home off Sonoma Mountain Road. Since then, the 40-year residents of Glen Ellen have slept at the lot in a compact trailer equipped with camping gear. Four of the 23 homes in their neighborhood burned down, and the fire burned right up to the Howeing’s front door. "The backyard has hummingbird feeders up and flowers blooming, and then the front yard looks like the moon," said Juliana Hoewing. The fire was four blocks away when Sonoma resident Michelle Rogers escaped the so-named LNU Complex Fire at 2:30 a.m. Monday. "All of a sudden, it just started coming down the hill towards us," she said. "With the wind, there was no predictable path." The California Department of Forestry and Fire Protection, also known as Cal Fire, said Friday that an estimated 5,700 structures have been destroyed in fires burning across California. Firefighters are battling 17 large fires in the state, the department said. In addition to the deaths in Mendocino and Sonoma counties, deaths in Napa and Yuba counties were also reported due to fires. Cal Fire said Friday night that the total deaths due to fires in the state was 34. 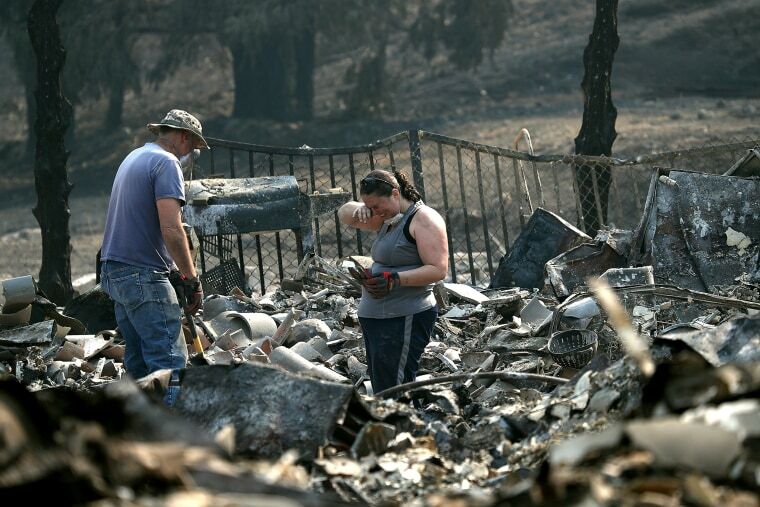 More than 2,800 homes have been destroyed in Santa Rosa in Sonoma County, including the home of the late "Peanuts" creator Charles Schulz, Schulz' son, Monte Schulz, told NBC Bay Area. The famous cartoonist’s widow, Jean Schulz, escaped, and the Charles M. Schulz Museum where most of his original artwork is contained survived. Some headway was made fighting a large fire burning in Napa and Sonoma counties, according to Cal Fire. The so-called Tubbs Fire, which was burning near Calistoga and stretched all the way to the Santa Rosa area, was 44 percent contained Friday night, according to the department, up from 25 percent earlier in the day. The Atlas Fire in Napa and Solano counties, which has burned more than 48,200 acres, was 45 percent contained, up from 27 percent Friday morning. Giordano warned that the fires are still dangerous, and at a news conference showed police body cam footage showing the dramatic first moments as deputies responded to one of the large fires after it broke out. "Go! Go! Go!" a deputy is seen shouting as he directs cars fleeing the fire area. "This is still a very dangerous event," Giordano said, urging people to stay out of evacuation zones and burned areas. Collectively, the fires are among the deadliest in the state’s history. The Griffith Park Fire in Los Angeles County in 1933 killed 29 people, and the Tunnel Fire in Alameda County in 1991 killed 25 people, according to Cal Fire.